Cenote Ik Kil is a sacred site to the Maya people, who once performed sacrificial rituals here. 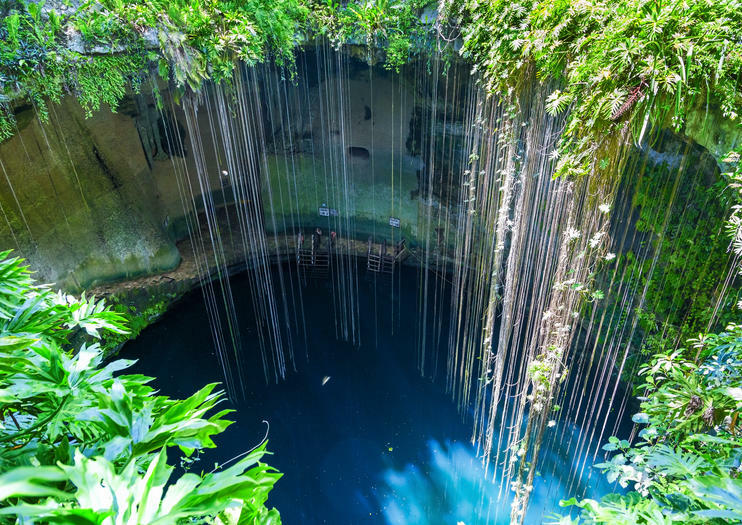 Located in the middle of the Yucatan Peninsula and surrounded by tropical vines and small waterfalls, the so-called “Sacred Blue Cenote” is now a lush swimming hole popular with Riviera Maya tourists. Nearly all excursions to Cenote Ik Kil are combo tours that include a visit to Chichen Itza, as well as possible stops at archaeological sites such as Coba or Ek Balam, or at towns such as Valladolid. (Tours typically last eight to 14 hours given the number of sites visited.) Unlike other cenotes in the Yucatan region, Cenote Ik Kil is open to the sky without a cave cover, giving the natural pool an ethereal feel with sunlight streaming down into the water. Part of Ik Kil Archeological Park, the cenote features vines hanging down from the rock walls. To get in the water, you must climb down 85 feet (26 meters) of steps. The pool is 196 feet (60 meters) wide and about 130 feet (40 meters) deep. The cenote can be difficult to access for those with limited mobility. A restaurant and changing rooms are located on-site. To access the cenote, you must pay the admission fee for Ik Kil Archeological Park. Cenote Ik Kil lies inland from Mexico’s Caribbean coast, roughly 125 miles (200 kilometers) from Cancun, 115 miles (186 kilometers) from Playa del Carmen, and 90 miles (145 kilometers) from Tulum. Private tours and transportation are available for those who want a more intimate experience without the hassle of driving. If you wish to visit the cenote on your own, arrive in the morning to beat the crowds. On the Yucatan Peninsula, cenotes and Maya culture go hand in hand. Archaeological sites featuring ancient Maya ruins abound, but the biggest and most popular destination is Chichen Itza, set just three miles (five kilometers) from Cenote Ik Kil. Once one of the largest Maya cities, this UNESCO World Heritage Site is known for its vast Great Ball Court and El Castillo, a step pyramid nearly 100 feet (30 meters) tall. The Yucatan Peninsula offers visitors a treasure trove of history, from the pre-Columbian archeological sites of the Maya civilization, to 16th century towns settled by the Spanish. Experience this history firsthand with a full-day tour from Cancun or the Riviera Maya. See the ancient Maya sight Chichen Itza, the pyramid of Kukulcan, and explore the architecture in Valladolid. After a busy day exploring, refresh yourself in the waters of the Ik Kil cenote, and enjoy a delicious buffet meal. The ancient world wonder of Chichen Itza is one of Mexico’s most popular landmarks, and the crowds it attracts reflects its popularity. This private tour to the UNESCO-listed Mayan monument ensures you’ll receive the undivided attention of your guide throughout the day. Your private tour also includes a swim in a cenote, a visit to the traditional village of Valladolid, lunch, and round-trip transport from your Cancun hotel. Visit two ancient Maya cities and a beautiful cenote on a full-day trip from Playa del Carmen to Chichen Itza, Ik Kil cenote, and Coba. You’ll learn about the dramatic history and symbolic architecture of Chichen Itza, swim in an underground river, and climb to the top of the tallest Maya pyramid in the Yucatan. This 12-hour includes breakfast, lunch, entrance fees, and round-trip transport from your Playa del Carmen hotel. Enjoy some of the cultural history and natural beauty of the Yucatan Peninsula on this day trip from Cancun. At the Maya cities of Chichen Itza and Coba, learn about the ancient civilization as you explore archaeological ruins with a guide. You’ll also visit Cenote Ik Kil to cool off with a swim. Lunch is included. The ancient Maya ruins of Chichen Itza are a UNESCO World Heritage Site and one of the most visited attractions in Mexico. On this private tour, combine a guided visit to the ruins with other Yucatan highlights. Admire the stunning pink lagoons of Las Coloradas, cool off with a swim in the Ik-Kil cenote, and spot pink flamingos and crocodiles on a cruise around the Ria Lagartos biosphere reserve. Explore Chichen Itza, a major archaeological site on the Yucatan Peninsula, during this all-day tour from Playa del Carmen. Wander around and learn about the Mayan ruins on a guided tour, as well as during your own free time. Then, swim in a nearby cenote and enjoy a buffet lunch before heading to the city of Valladolid. This comprehensive tour combines two of the most important archeological sites of the Yucatán Peninsula: Chichen Itza and Coba. Let a guide accompany you around the ruins and explain their significance. This day trip from Playa del Carmen includes breakfast, beverages, a buffet lunch plus a swim in Ik Kil Cenote. Make the most out of your time in the Yucatan by booking this full-day guided trip to Chichen Itza and Coba, two of the most important archeological sites in the southern Mexico. Take delight in the sight of these wonders and then indulge in a hearty Mexican lunch. After, visit Ik Kil cenote. Explore the archaeological site of Chichen Itza, one of the New7Wonders of the World. This full-day trip from Cancun takes you to the ancient Maya city, followed by a visit to the colonial town of Valladolid and nearby Ik Kil cenote. A buffet lunch and visit to Real Mayab Hotel is included. Meet and enjoy the enigmatic Chichen Itza archaeological site, fabulous ceremonial center of the Mayan civilization, named a World Heritage Site by UNESCO and its renowned Temple of Kukulcán, considered one of the 7 New Wonders of the Modern World. Make this magical journey through time, discovering the secrets stored in the buildings of this ancient city of the Mayan civilization, one of the most advanced in the pre-Hispanic world.Admire and contemplate several buildings such as the Market of the Thousand Columns, the Temple of the Warriors with the statue of Chacmool, the Game of the Ball, the Temple of the Jaguar, the astronomical observatory El Caracol and the wonderful Temple of Kukulcán, one of the most emblematic monuments of the Mayan civilization, characterized by its pyramidal form, Egyptian style. Explore two important ancient Mayan cities and swim in a refreshing cenote on this all-day guided tour. After convenient hotel pickup, head to Chichén Itzá to learn about its pre-Columbian temples, observatory, pyramid, and ball court an informative guide. Cool off in Cenote Ik Kil, enjoy lunch—included in the tour price—and tour Cobá, which was once among the largest and most significant Mayan cities. Experience the ancient magnificence of Chichen Itza — one of the New7Wonders of the World — on a full-day trip from Cancun. As you travel through the scenic countryside of the Yucatán, you’ll enjoy an on-board breakfast before arriving at Chichen Itza. Embark on a 2.5-hour guided tour of the monument and visit prominent features like El Castillo and the Temple of Warriors. Then, revitalize with a buffet lunch before plunging into the cool waters of a cenote and taking a panoramic tour of traditional Yucatán town, Valladolid. If your time in Mexico is limited, tick off three top attractions in one day on this private 9-hour tour from Cancun. Save time by travelling to Chichen Itza — one of the New7Wonders of the World — in an air-conditioned vehicle and take a personalized tour of the UNESCO-listed site. Plunge into the Ik-Kil cenote for a refreshing swim and visit the colonial town of Valladolid. Lunch and round-trip transport from your Cancun hotel are included. Visit two ancient Maya sites on a full-day, private tour of Coba and Chichen Itza from Tulum and the Riviera Maya, with a break to swim in the gorgeous Cenote Ik Kil. At Coba, explore a site that’s partially covered with jungle, climbing the tallest pyramid in the Yucatan Peninsula. After cooling off in Cenote Ik Kil, continue to Chichen Itza to see some of the Maya world’s most dramatic art and architecture, from the Temple of Kukulkan to a stone platform carved with human sculls. This private tour includes two major archaeological attractions of the ancient Maya plus swimming in the crystal-clear waters of Ik-Kil (Sacred Blue Cenote). With a personal guide you’ll explore Chichen Itza, designated one of the New7Wonders of the World, and climb the Yucatán’s tallest pyramid at Coba: Nohoch Muul. Hear informative commentary and dine on a buffet lunch, with private hotel transport included from Cancun. Reach two of Mexico’s most impressive attractions during this action-packed, double-duty guided tour, which takes you to Chichen-Itza archaeological site and Xcajum cenote. Relax and settle back for an all-inclusive experience, cutting the hassle of getting to each location. Enjoy unlimited drinks, air-conditioned transportation, an expert guide, and a regional buffet lunch. Top off your visit to the immense ancient ruins with a refreshing dip in turquoise waters. Enjoy personalized attention and a flexible itinerary on this jam-packed full-day tour that hits all of the famous Mayan sites around the Riviera Maya. With private transportation from Riviera Maya or Cancun, visit Chichen Itza, Ek Balam, and the Ik Kil cenote with a dedicated guide. All entrance fees included. An early morning pick-up from your hotel means arriving at the archeological treasures at Chichen Itza before the crowds and heat. Your guide will show you around, telling you about the history of the site before you enjoy some time on your own. From there it’s time to cool off at the Cenote Ik Kil. End the day discovering the town of Valladolid. Take advantage of this unique opportunity to get acquainted with the Mesoamerican cultures of the Yucatan Peninsula. This private day trip to Chichen Itza includes a cenote swim at Ik Kil followed by a shaman-led purification ceremony inside a ‘temazcal' — a type of ancient Maya sweat lodge. A buffet lunch and round-trip hotel transport from Cancun or the Riviera Maya are included. Immerse yourself in the fascinating culture of Mayan Mexico on a full-day trip to the UNESCO-listed Chichen Itza from Cancun. Alongside a guide, you’ll take a guided tour of one of the New 7 Wonders of the World and see iconic structures like El Castillo and the Temple of Warriors. Then, plunge into the azure waters of a cenote, a natural pool surrounded by lush vegetation, and revitalize with a buffet lunch. Entrance fees and round trip transport from your Cancun hotel are included.